AIM: To gather information about historic buildings in Buckinghamshire from fire insurance company records in the London Guildhall archive. Many Buckinghamshire houses, farms and business premises were insured with London-based insurance companies during the 18th and 19th centuries. 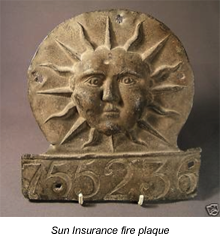 Even today many of our historic buildings still display ‘fire insurance plaques’, indicating that any costs incurred in putting out a fire would be reimbursed by the company. Naturally it would be too much to hope that this information might be ordered alphabetically by county and town. The company simply wrote the business down in ledgers as it came in. So the first task of this project is to trawl through the records, finding and transcribing details from entries for Buckinghamshire, sorted by town. Here is an outline of how the work is done. The information from each entry is then added to a database, along with a digital photograph of the original entry. If the property can be identified with a building that still exists today, the results can be tied into the Buckinghamshire Historic Environment Record. Progress on the project was initially slow, in part because the Guildhall archives were closed for refurbishment early in 2009, but records were transcribed for Amersham, Aylesbury, Beaconsfield, Buckingham, Marlow, Newport Pagnell and Winslow.